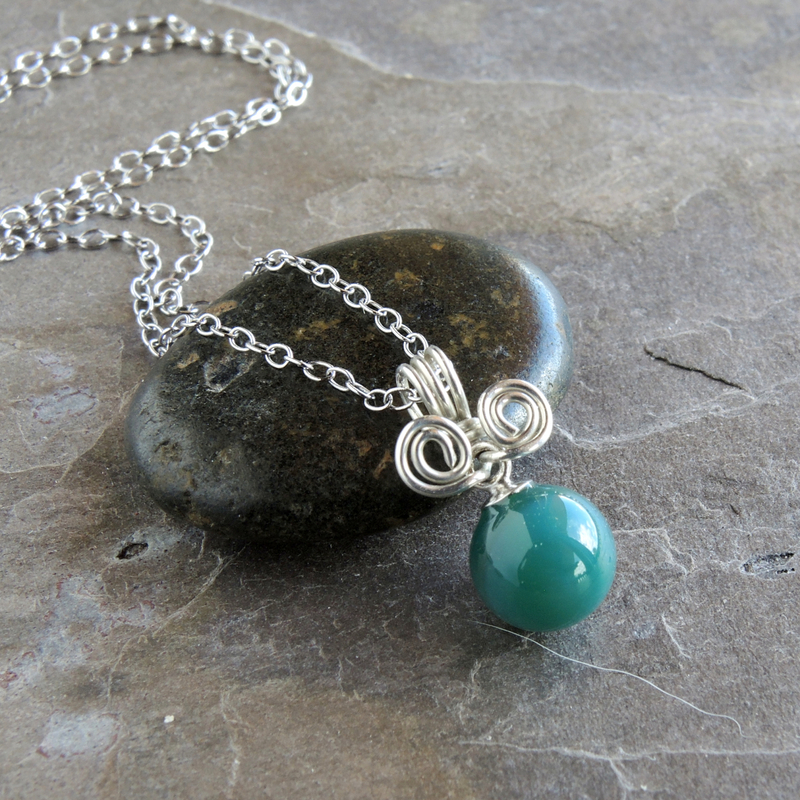 This fanciful necklace sports a shiny green gemstone sphere with fun swirly sterling silver wire work bail. The small green gemstone slides on a delicate sterling silver chain for a simply sweet and modern everyday piece of jewelry. Green gemstone pendant hangs just about ½"
The green gemstone sphere is about 5/16-inch in diameter, very round, smooth and glossy. I've used a half-drilled gemstone sphere from my Dad's lapidary hobby stash from the 1960's and 1970's. I believe the pretty green gemball is dyed green onyx because of the mottled, slight hint of banding and the milky translucence of the stone. It could be dyed agate, but as agates tend to be more translucent my bet is on onyx. Unfortunately, there is no way of knowing with certainty, so it is a green gemstone sphere! I set the deep green stone in a simple sterling silver cap and then fabricated a decorative wire wrapped bail that would easily slide along the chain. In all, the wire bail and the gemstone measures about 5/8" long. It is a petite pendant to hang short on your neck. 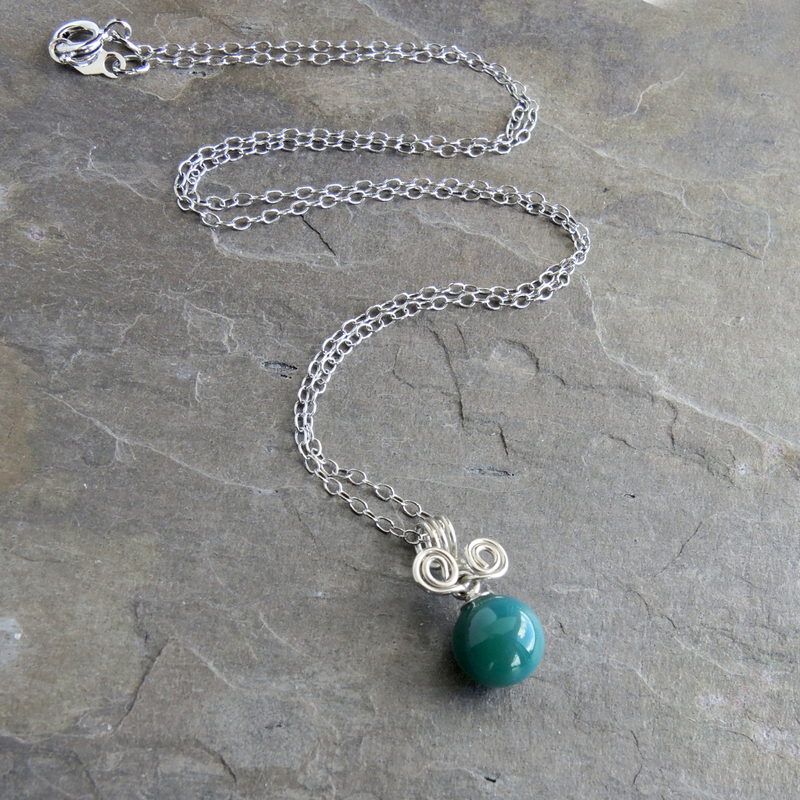 I used a very delicate and airy link chain of sterling silver that creates a "barely there" effect and allows the deep emerald to sea green gemstone to shine. The neck chain is finished to 16" long. It closes with sterling silver spring ring clasp and easy to handle chain tag. This dainty modern necklace has that barely there style that is easy to layer with other necklaces. So much interest in a small item: the clean roundness of the stone, its fabulous polish, and the cute sterling wire work. The color also invites scrutiny. Is it emerald green? Sea green? deep turquoise? I think this green sphere necklace would be really great worn very short - not quite choker length but up high on the neck. I've made it 16" as a good starting point for most women. If you'd like it shortened please let me know upon ordering.